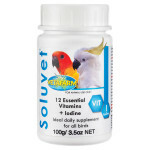 Powdered vitamin supplement for use in water or added to foods. 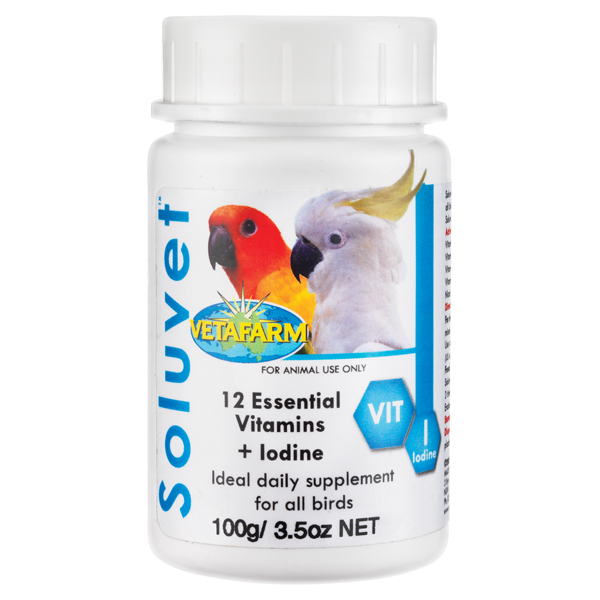 Contains all 12 essential vitamins plus iodine required for a balanced diet in birds. 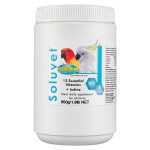 Freely soluble in water and can be added to foods such as soft food or homemade hand rearing mixes. 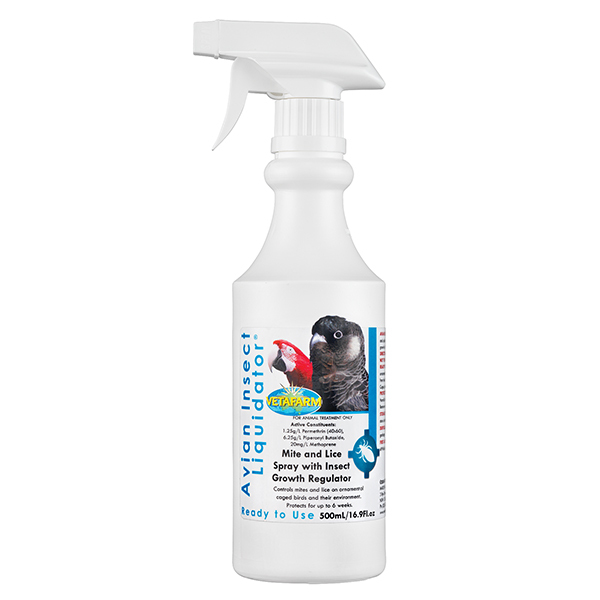 Can be given to sick birds to aid in recovery. All birds on seed diets. 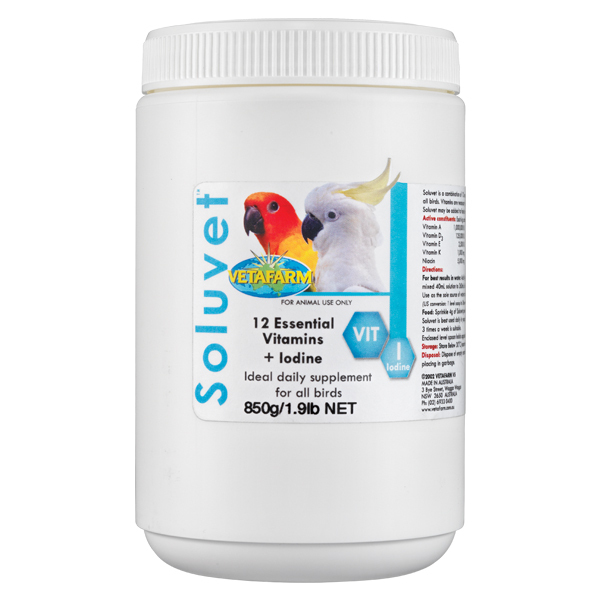 Soluvet should be used in conjunction with a calcium supplement, Calcivet or D Nutrical for birds on seed diets to ensure balanced nutrition. For best results in water: Add 4g to 40mL of warm water (30°C – 40°C), stir well to dissolve. Then add the mixed 40mL solution to 360mL of drinking water. Use as the sole source of water and prepare a fresh solution daily. US conversion: 1 level scoop to 3Tbs warm water (86ºF-104ºF), then add 1½ cups of water. Food: Sprinkle 1g of Soluvet powder over 1 cup of soaked seed or greens. 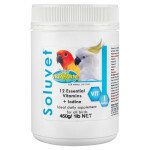 Soluvet is best used daily in young birds before the first moult or for sick/injured birds. For mature birds, 3 times a week is suitable. 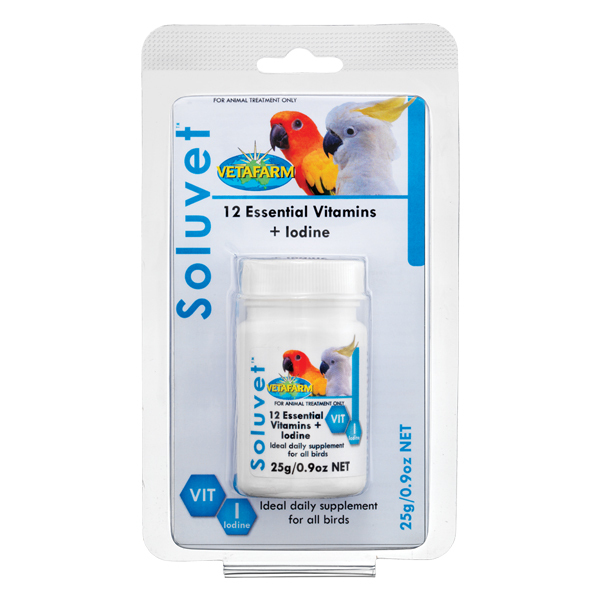 Vitamins (A, B1, B2, B3, B5, B6, B9, B12, C, D3, E, H and K), iodine, choline bitartrate. 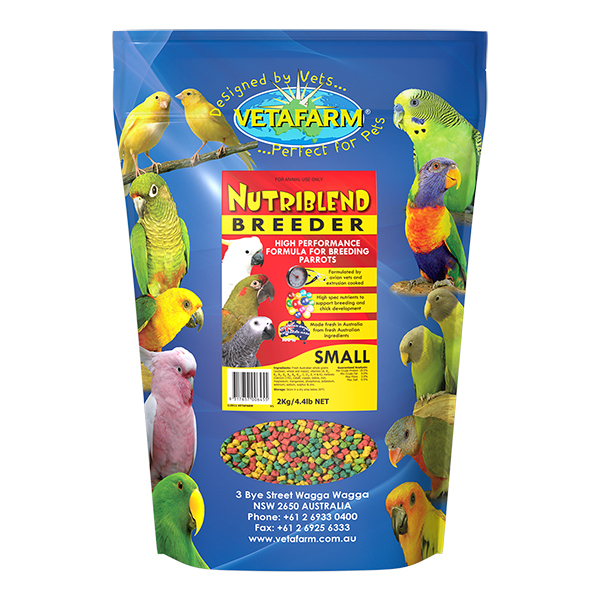 High performance formula for breeding parrots. 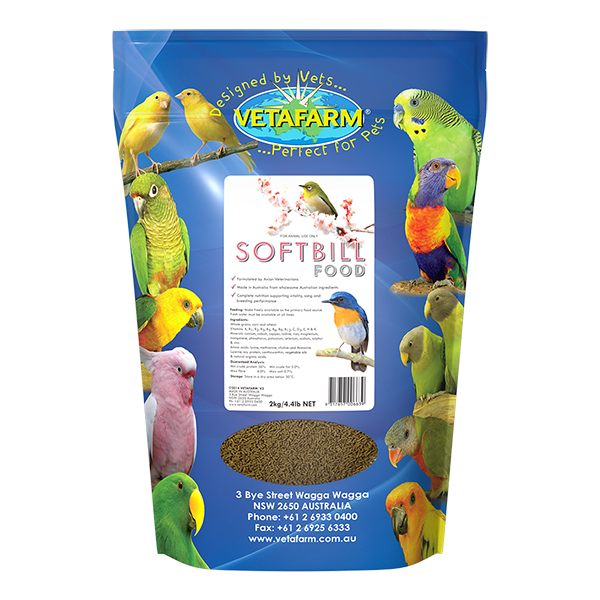 Flavoured, multicoloured pellets promote better acceptance by seed-eating birds. 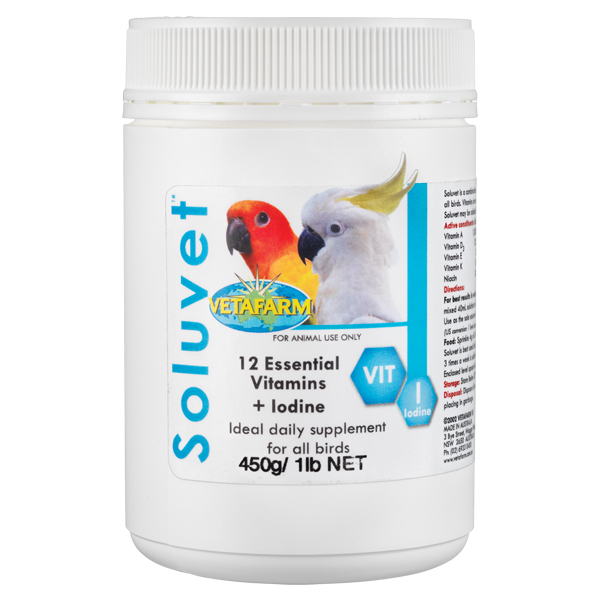 Includes balanced vitamins, minerals, calcium (1%) and amino acids essential for the breeding season. Eliminates waste associated with seed and ensures a longer healthier life by providing scientifically formulated nutrition. 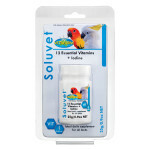 Complete nutrition supporting vitality, song and breeding performance for Soft Bills.